Help others find us by writing a review about your stay on Google and liking us on Facebook. This is a great place. We will be back. If you have an RV & love the Pacific Ocean Beaches, this is the place to stay. It is very private & well maintained. We stayed in August 2012 for a few day’s & just went again last week for a few day’s because we loved it so much. With full hook-ups & cable for TV & a huge bathroom with shower if you use the facility.Deer come into your campsite. We go during the week, so there was probably only 5 other spot’s being utilized.There’s only room for 20 so if you like privacy & walking in the woods & beach, this is the place you need to visit. I wanted to go back in December but my husband wants to winterize the camper. Guess it will be in a few more months. Can’t wait. My wife and I found your RV Park by chance. We have had an amazing time here. I’m glad we took the chance. We have been here for one week and have one week left to go. The only drawback is that we have to go home. I cannot, in recent memory, remember a place as nice as this. I love the large open sites, the concrete pads, the fire pits, the atmosphere, and most of all, the hospitality. Susan operated a top shelf establishment and I highly recommend it to anyone that may be planning a trip to this area. We will be back again. Just to let you know we had a most enjoyable stay. The landscaping is beautiful and much appreciated along with the very generous concrete RV parking pads. The restrooms/showers were immaculate. The close proximity to Ocean Shores and the no hassel, quiet, casual atmosphere make this a resort we definitely want to revisit. We started our summer vacation down the coast at Ocean City on August 3rd- what a great way to start the trip! Susan was great, keeps a beautifully maintained park, very clean bathrooms etc. Probably the best private site we’ve stayed at~ Five minute bike ride through the trail or road side to the beach. Vehicle access to on beach is just down the road as well~ Would definitely come back if we were in the area. Susan, Thank you for a great trip to Ocean City. We were very happy with our experience. The extremely clean, large separate bathrooms and shower facilities were wonderful. The easy walk to the beach on your maintained trail made toting our two kids and beach stuff so fun. The private access really is “private” and it is close to the resort. We were impressed! We basically had the beach all to ourselves and it’s a wide open sandy beach with plenty of shoreline and lots of sea creatures. We even saw an Eagle! You were so hospitable and friendly and we made friends with the other campers who were relaxing and enjoying themselves as well. Fire pits; level, large, clean concrete slabs for parking; and plenty of space for privacy. It was also so quiet and peaceful, but our 7 and 8 year old kids were able to run around the large circle drive and play like kids need to. You operate a top notch resort and we will recommend it to others and be coming back for Labor Day in a few weeks. Ocean City RV is a very nice and clean campground. Very well maintained and the hospitality is awesome! My family thinks Susan’s place is the best we have seen and we will always be here when we come to Ocean Shores! Can’t wait till next time! Thanks for the great weekend and friendly camp ground!!! Four Stars from our family!! beautiful park. Walk to the beach. Fire pits at each site. Cemented site. well landscaped and beautiful. Definitely a five-star park. We’ve been coming to see you for several years. We always enjoy ourselves and the site. We’ll see you next summer! You CANT find a better place to go than this!!!! Susan is by far the best host we have met so far 🙂 Great place to take Family and Friends. Thank you for a wonderful stay at your resort. You have a wonderful park and I can tell you you have not seen the last of Ginger and I. The sand dollars will be a great hit with our grandchildren. Thanks again for your hospitality. one of the nicest r/v parks my wife and I have seen, we’ve travled as far east as michigan and as fer south as calif. with our rigs. we’ll be back. My wife and I stayed at your resort for two days during our vacation. It was the best place we stayed at on our 18 day vacation. We didn’t get a chance to meet the owners, but the hostess Tessa took wonderful care of us. She is a hard worker whom went above and beyond the normal expectations one would expect. Thanks again Tessa we will be back soon. Hope you are still there. Get the golf carts going!!! What a great time we had at your resort. It was wonderful to see you expanding as we were there during the big pours for the new pads. With all that was going on, we were welcomed, and we felt at ease. What a wonderful place to stay. The beach access is second to none, and the restroom and showers were the cleaneast of any we have stayed at. So next year, about October, expect to see this maroon Ford pulling in with the pop up camper. Have a great winter. Had a great labor day weekend. The site was great, we especially enjoyed the fire pit. Great proximity to the beach. Very friendly atmosphere. Hope to be back soon. Your feedback is remarkable! I’m looking forward to a visit! Very nice! We stayed at the resort last weekend and had a great time. I have never stayed at a park yet and seen the service you two offered. The restrooms are extremly clean and the campsights are great. You are a first class resort!! 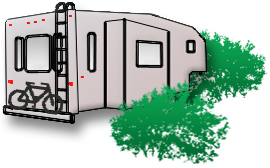 We have stayed at your RV Resort serveral times in the past year that we have had our RV. Each time our stay is very enjoyable. From helping you get set up, clean restrooms & showers and golf carts. The landscaping is very nice also. Thank you so much for putting up with our clan during our stay with you. We couldn’t have asked for a nicer place to stay. If we come back to Ocean City, we will definetly make our reservations with you. Again, our thanks for a nice week. And yes, the golf cart ride to the beach was breathtaking and beautiful. Wanted to THANK YOU ( and the Doggies) again for such a wonderful Welcome to your beautiful place. We actually arrived in Ocean City a few weeks ago with our friends Kitty & Ed to “another” RV Resort nearby that when we got there appeared to be abandoned, and boy, are we glad we left it and found you!Your place made all of us ( even the kids and dogs) feel safe and at home. We feel like we have made friends for life! Oh and Susan, Thanks for the ride to the beach, Thanks for the fire! We didn’t get a chance to see you before we left this morning but wanted you to know how much we appreciate your thoughtfulness and kindness during our stay with you. From the moment I first talked to you on the phone making reservations, you went above and beyond what a regular camp host would do. It is obvious that you love your jobs. Getting a chance to sit and visit with you around the campfire was an experience we will be telling our friends about for years. You went out of your way to make our son, Scott, welcome too and I know he appreciated that. He kept telling us that we were staying at the best campground in the area and he was definitely right. The site you gave us was perfect in every way and I really didn’t want to leave. Rest assured we will return to visit. We stayed at your place this past weekend and we really enjoyed your resort, perfect location. A clean park with direct access to the beach. Loved hanging out around the fire. You guys are great. Want to Thank You for all your courtesies and tell you how much we enjoyed our stay at Ocean City RV Resort. Hope to see you again.